Whirling Dancer, NGC 3247 in Carina. To our eyes, this is not a Dervish, but an animated bulldog in a powdered wig and a certainly whirling ballgown. 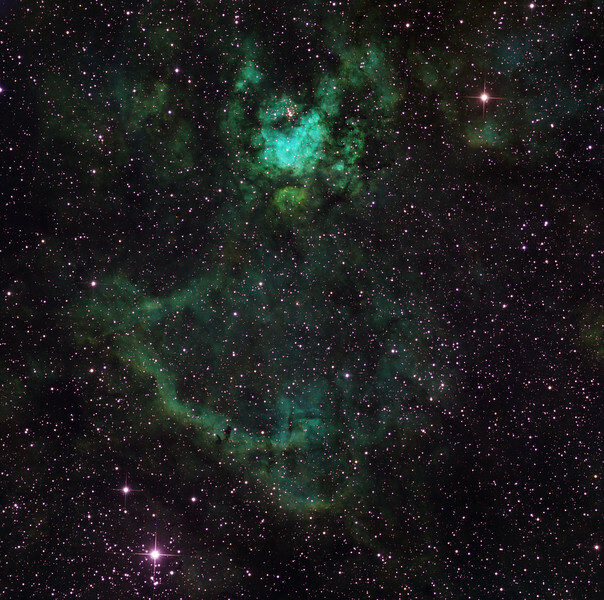 One of the gentler star-forming regions, with only very weak OIII and SII. Red: SII 6hrs, Blue: OIII 6hrs, Green H-alpha 4 hrs, all unbinned. Aspen 16M on 20" PlaneWave. As usual, all observatory control and image processing software written or built by Mike.